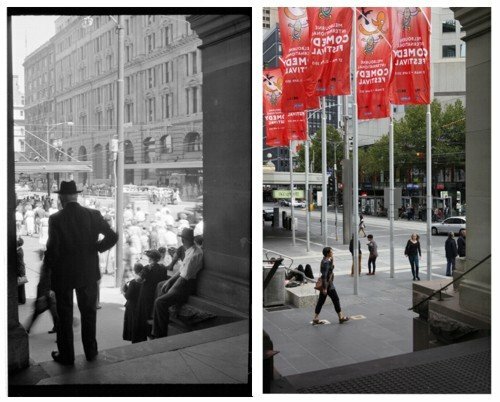 Let me introduce you to the “Retake Melbourne” project. I was fortunate that James McArdle has introduced me to a project that is all about re-photographing Melbourne. They key to this is project is the the vast collection of visual data in the State Library of Victoria’s collection, in particular immigrant Australian photographer Mark Strizic’s 5000 half-century-old negatives, colour transparencies and slides, which were acquired in 2007. The aim of the Retake Melbourne project is to create an app, that makes it easy for any Melbourninans (or visitors) to take part in the project by photographing Melbourne. Your images might become valuable records, as Strizic’s are now, to researchers in the future! They will compare your view with Strizic’s to see how the city has changed. 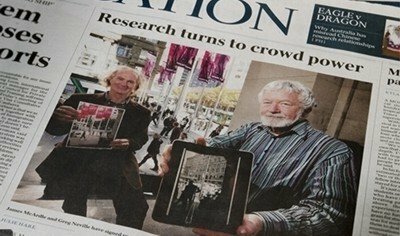 You can be in on the birth of Melbourne’s first comparative photographic research project. With this app, members of the public can find locations photographed by Strizic on a map, orient their device’s camera closely to the angle, orientation and framing that he used using a transparent overlay of his image, downloaded from the SLV online collection, over their screen image. This app will simplify the repeat photography exercise and enable you to produce a comparative image which will match or contrast existing conditions and features with those in his original image. But first they need the tech to do it; a photography app that contributors will be first to use! So that’s where James McArdle is asking for your help at present. Using the crowdsourcing website Pozible, James put the project up with the hope of getting $6000, and with just a few hours left to go has already reached that target. After speaking to James he advises that he’d really love to make it to $10,000 as that will help them with costs associated with matching locations from 50 years ago to today that no longer even vaguley resemble what they were. To keep up with news about Retake Melbourne you can follow James on Facebook, Twitter, LinkedIn, Academia, or check out his Blog.